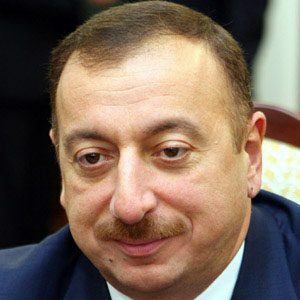 President of Azerbaijan who took office in 2003 amidst charges of nepotism and corruption. His regime is considered one of the most dishonest and authoritarian in the world and in 2009 he passed a referendum which removed the presidential consecutive term limit so that he could continue to rule his country. He ran the country's government-owned oil company SOCAR, and negotiated with the West extraction rights. Several international organizations have noted his concentration of state resources into the government's hands has made him enormously wealthy, while many of his people live in poverty. His father Heydar Aliyev preceded him in office, as president of Azerbaijan from 1993 to 2003. Sacha Baron Cohen used his portrait as the one for his fictionalized leader of Kazakhstan.